Teahupoo, which in Tahitian means something like “the place of broken skulls” in reference to a much feared ancient king who collected his enemies’ heads, is the name of one of the world’s heaviest and most dangerous wave breaks, unique for its shape and for the massive volume of water it lifts, in the town of the same name, off the south-west of the island of Tahiti. A unique natural phenomenon and a mythical word for surfers. For her exhibition at ProjecteSD, Patricia Dauder has chosen Teahupoo as the title, of no clear significance for most of us, precisely to avoid giving a predetermined reference to the show’s visitor. Dauder grants Teahupoo a symbolic meaning. In her own words: “It is an icon, that of an spectacular wave, a symbol of absolute beauty and of the idea of paradise”. Teahupoo is a mental projection which gives rise to a constellation of images, real and fictional, which materialize in two media regularly used by the artist: drawing and still or moving image. 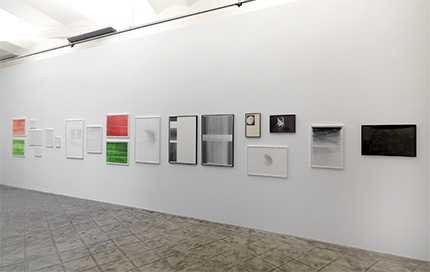 Despite not all the works in the exhibition necessarily refer to the location and the legendary wave, they all share two ideas which the artist finds in Teahupoo: “the distance between imagined and real, between idealization and real experience, between what is close and familiar to us and that remote and unknown, and the possibility or impossibility to express this distance through image“. Drawing is highly explorative in the hands of Patricia Dauder. It can be seen as a constructive deconstruction, a microcosm of plentiful associations and iconographies. 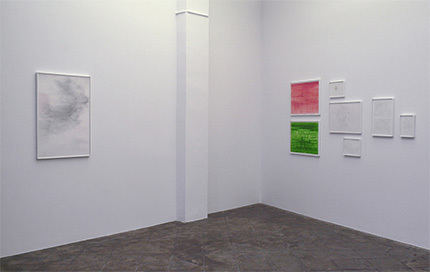 Thus, Teahupoo unfolds as a collection of drawings of different formats and techniques which compose the mental place which gives title to the show. Accurate subtle graphite lines blend with colourful watercolors maybe evocative of the exuberant tropical vegetation or the intense light of the afternoon. Biomorphic traces and elliptically shaped images contrapose to gridded linear constructions. References to natural elements mix with allusions to the cinematographic medium (Two Frames, Three Frames) experienced by the artist as a tool for observation and for sequencing space and time. Clouds, atmospheres, waves or undefined places co-live in this non-hierarchical composition where associations are not delimited. 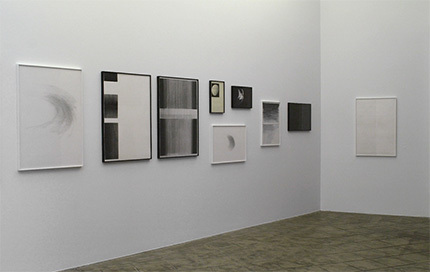 Regardless of their fragmented presentation, all drawings are part of one same idea. The idea of process and of a “not-completed”, “not finished” work is evidenced in all the drawings and it signifies some important aspects in the artist’s oeuvre: the non-linearity, the multiplicity and the idea of accumulation. 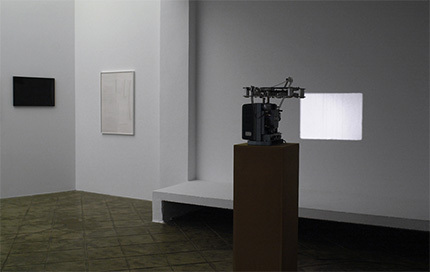 Two filmic/photographic works complete the exhibition and, to certain extent, confront the drawing installation, in the sense that they are basic raw recordings of an immediate palpable reality. Forward (slides) (2009) is an 80 black and white slide projection showing a series of aerial movements performed by professional windsurfers. The sequential presentation of this collection of still images introduces certain tension created between the evanescence of the own set of images in movement and the permanence of the static image, between the continuous present and the reminiscence of the past image. Forward (slides) can also be interpreted as an exercise of perception to how image is visualized and constructed. Forward (film) (2010) is a 16mm film showing a series of environments, landscapes and actions shot during the celebration of one of the competitions of the professional windsurf world championship in Pozo Izquierdo (Gran Canaria), place known worldwide by its extreme conditions of strong winds and heavy waves. The film, thematic particularities aside, is a direct transcription of the artist’s perception both of the location and of what is taking place there and, most importantly, of the shooting process itself. 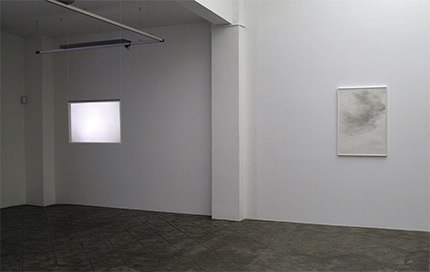 The environmental exposure, the reduced visibility caused by the haze and dampness of the area, the unsteadiness of the camera caused by the strong wind, the excess or lack of light, together with the artist’s approach, fragmented and uneven, are the real subject of the work, in an attempt to make of the film a recording of an experimentation, detached from any possible narrative. If in a first reading of Forward (film) the film reminds us of earlier works such as Surfers (2005) or Cutsurf (2009), a closer look reveals that the link to these other films does not lie in the motives in them represented. All these works talk about a way to observe, show and order a reality which belongs to the most immediate surrounding of the artist.